The ACLJ filed an amicus brief with a federal appeals court supporting the federal government's request to overturn a lower court decision that declared a key terrorism surveillance program of the National Security Agency (NSA) unconstitutional. They make quite a well put together argument. Please share with your readers. In two weeks Democrats have lost a 7 point advantage on the war on terror and a 9 point advantage on immigration. The message is getting out and we are in the final two week stretch!!! Plus this is based on a sample that is not weighted to reflect the most likely turn out. Dems Kill Child Custody Protection Act Like They Do Human Beings! ACLU "the Anti-American Criminal Liberties Union"
The ACLU will sue to stop voluntary prayer by the military and it will sue, demanding the military support Muslim religious practices by terrorist detainees. Sinclair Broadcast Group commentator Mark Hyman referred to the American Civil Liberties Union (ACLU) as "the Anti-American Criminal Liberties Union" on the September 13 edition of "The Point." The American Criminal Liberties Union fancies itself as the protector of individual rights. The reality is the ACLU is a bunch of ambulance chasers with an extremist agenda. Hyman has previously attacked the ACLU; for example, on the March 31 edition of "The Point," Hyman claimed: "Not unlike the Communist Chinese, the ACLU abhors individual religious freedom, and it supports only those civil liberties that fit its narrow political agenda." 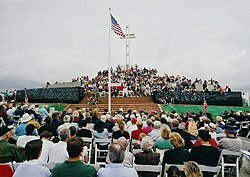 Justice Kennedy has issued a four page order keeping the Stay in place which protects the cross at Mount Soledad during the full appeals process. This Order extended the temporary Stay that was issued earlier this week. In his opinion, Justice Kennedy relied heavily on the fact that Congress had intervened with a legislative remedy. We represent members of Congress that actually proposed the legislation. Because of your help we were able to file an amicus brief on behalf of these members of Congress with the Supreme Court. You can read Justice Kennedy's order by clicking here. In blocking a federal judge's order that the city remove the cross by Aug. 1 or face a daily fine of $5,000, Kennedy also indicated that the full court may want to review the controversial case. Kennedy said the court, which refused three years ago to get involved in the dispute, may consider it because of two new factors favorable to cross proponents. He cited legislation to make the area a national veterans memorial and a successful ballot initiative in which San Diegans overwhelmingly voted to transfer the land to the federal government. The move is a big boost for cross supporters and the city, which wants to preserve the La Jolla landmark. The cross is part of a memorial to war veterans, but has been ruled an unconstitutional preference for religion. "It's phenomenal news," said Phil Thalheimer, leader of a pro-cross group that is trying to get the federal government to gain control of the land. "We're winning big." James McElroy, the lawyer for Vietnam war veteran and atheist Phillip Paulson who sued in 1989 to remove the cross, said he was surprised and disappointed at the ruling. "I certainly understand the court's logic, but I disagree with it," he said. In May U.S. District Judge Gordon Thompson Jr. gave the city until Aug. 1 to take down the cross or face the daily fine. Thompson, a San Diego federal judge, ruled in 1991 that the cross violated the state constitution's ban on government showing any preference for a religion. The city appealed the deadline order, seeking to block it while its appeals in two courts proceeded. On Monday Kennedy issued a temporary order that froze action until he ruled again. That ruling came late Friday afternoon. Kennedy issued a four-page opinion outlining his decision, an unusual step in such instances. In it, he noted that there are two appeals pending one in federal court, and a second in state courts that could decide the fate of the cross. Given that, as well as a congressional proposal to designate the cross a national war memorial, Kennedy said it was best to delay any move to take down the cross. He wrote that in balancing all the arguments "the equities here support preserving the status quo while the city's appeal proceeds." He also said it was likely that four justices on the high court would be willing to review the case if the federal appeals court upholds Thompson's order. That bolstered Thalheimer. "It's a strong indicator that no matter how the Ninth rules, the Supreme Court will take this case," he said. Cross supporters believe they have a very good chance of winning if the case gets to the high court. Kennedy also left the door open to perhaps dissolving the stay later, writing that "if circumstances change significantly, the parties may apply to this court for reconsideration." McElroy said he interpreted that to mean that if he wins in the appeals courts Kennedy would be willing to lift his order blocking removal. The city has an October hearing in the federal appeals court to argue that Thompson abused his discretion when he issued his order in May to remove the cross. The state court appeal focuses on Proposition A, passed last fall by 76 percent of the voters. It would hand the land over to the federal government, meaning the cross would no longer violate the state constitution. But Superior Court Judge Patricia Yim Cowett ruled that the measure violated the state constitution because it showed a preference for religion, and amounted to aiding a religion. The state appeals court in San Diego has placed that appeal on a fast track, meaning the case will likely be heard in the next couple of months. 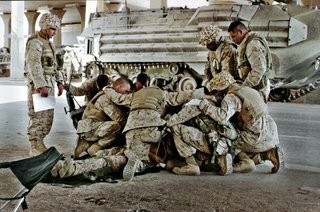 Soldiers have a right to pray. 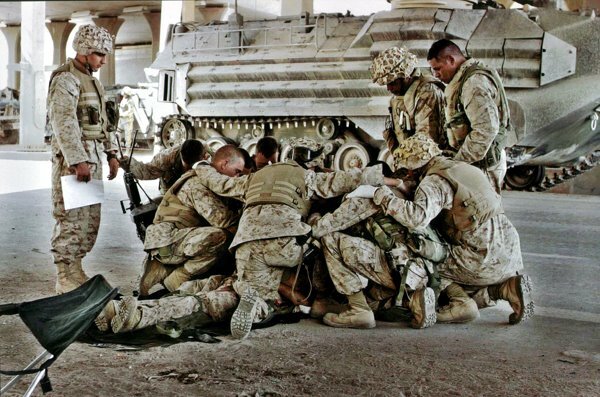 Marines pictured are bowing their heads. That's because they're praying. When asked about the ACLU's charges, Colonel Jack Fessender, speaking for the Commandant of the Marine Corps said (cleaned up a bit), "Screw the ACLU." GOD Bless Our Warriors, Send the ACLU to France. What's wrong with the picture? ABSOLUTELY NOTHING. Call your local chapter of the ACLU and give them the hell they deserve about this attempt to take away the right of our soldiers to pray. Let's all work hard to stop the ACLU from intruding in our lives any way they see fit and demanding to be paid from our taxes when they sue us. ENOUGH!!! Just a mom and grandmother with stories to tell to all who will listen. I enjoy the beauty of nature, the innocence of a baby, the smile of a happy person, listening to silence and hearing - I love you.